Does a trail network over 500 miles long sound awesome to you? Come out and support the Meramec Valley Trail Association's project to connect the Ozark Trail to the Great Rivers Greenway. This connection will create a trail network extending from St. Louis to very near the Arkansas border. Come out to the beautiful Venue at Maison du Lac in Catawissa on March 9th at 6pm, racing start at 7. 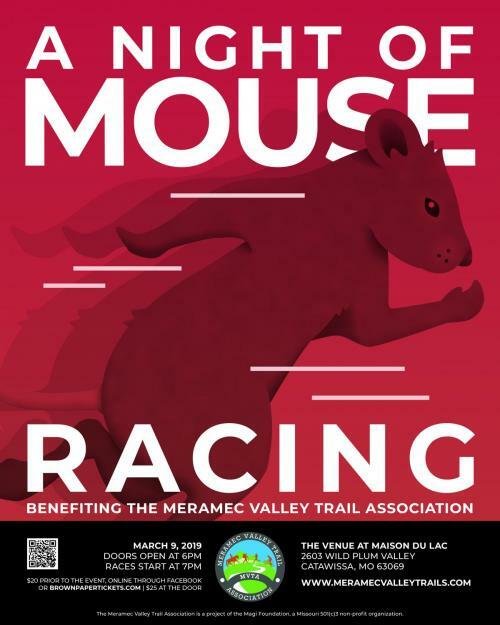 Along with Mouse Races, we will have a Mouse Roulette Wheel, Plinko, and Chuck-a-Luck with a silent auction and 50/50 raffle. Racing will start at 7:00pm. We will have great silent auction items from the Mountain Bike Shed, Revolution Cycles, Alpine Shop, and more! Station hors d'oeuvres and non-alcoholic beverages are included with admission. A cash bar will be serving beer, wine, and mixed drinks. Guests must be 18 years of age or older to attend. Online sales are limited to the first 250 people so purchase your discounted tickets early for $20/person online or at the gate for $25/person. Tables seat eight people, but chairs can be added, if needed. Ticket options are available for groups of 4 and 8 to ensure a partial or full table is reserved just for your group. GET YOUR TICKETS NOW! Thank you all for your support, and I hope to see you there! Thanks to everyone that came out to our fundraiser on Saturday! I hope you all had a great time, and thank you so much for supporting our project!